The guitar is one of the most popular and best instruments to learn today. Knowing how to play the guitar can be a source of increased self-esteem, you can be the star of the night or the life of the party in social gatherings, or it can also be a source of income if you want to go professional. There are many ways of playing the guitar, the most famous and well-known are the styles of rhythm, lead, and fingerpicking. In this case, if you read further, I will show you the ways on how to fingerpick guitars. Learning will take time, but learning the style of fingerpicking would be worth all your while. Fingerpicking is a way of playing the guitar, it mainly involves your left hand holding the chords and plucking the strings with your right fingers independently. Fingerpicking doesn’t involve strumming or playing with a pick. The advantage or distinction of fingerpicking among other styles of playing the guitar is that it gives off the illusion that there are several guitars being played at the same time. This illusion comes from the fact that fingerpicking involves playing bass lines with the thumb and also playing melodies and chords with the other the fingers at once, as well. Playing the style of Fingerpicking is pretty interesting, isn’t it? It can give you the illusion of being a one man band, where you can play entire songs without the need of other instruments. It maximizes the full potential of the range of notes that can be played on the guitar. Now, let’s take a step further and learn the ways of Fingerpicking. Before we begin practicing Fingerpicking or playing the guitar with just any style, we must first check the guitar’s condition. The good condition of the guitar’s parts, the body, neck, fretboard, and strings, are all essential in its function and sound. So here are some tips on checking the parts and maintaining their good condition. The Fretboard and the body are the parts of the guitar that are the easiest to check. Just make sure that there are no indentions or holes in its structure. To maintain the body, wipe it with a soft cloth and a little bit of warm water every after use. Use the same method for the Fretboard, but cleaning it is only advisable when you are changing your strings. Speaking of strings, you must clean and change them regularly. They break now and then, especially if you are often playing. It is advisable to change your strings as a whole or sets because if you change only one string, the others will also break in time anyway. And having strings of the same set will give you a more balanced tone. After checking and finding that your guitar is in great shape, now it is time to check the tune of your guitar. Having a well-tuned guitar is obviously important before playing, otherwise, it will give off all the wrong sounds, and you wouldn’t improve your fingerpicking skills no matter how you practice. The idea or theory behind a well-tuned guitar is that all the strings give off relatively harmonious tones with each other. The sound that is produced in each string must have the appropriate intervals of lows and highs of tones. So if you think that the tones and sound that your guitar gives off are well-balanced, then you’re good to go in practicing Fingerpicking. However, if you don’t know how to tune your guitar, you can check at here. Now that you and your guitar are ready let’s go and learn fingerpicking! We will discuss the basics first, and then we’ll try to do next level stuff like patterns of fingerpicking. Fingerpicking, as discussed, requires you to drop your pick and use your fingers. It is a good idea to stretch your fingers and make them loose by doing some fingerpicking exercise. The first thing to do is place your hand as naturally as possible on the guitar, and keep your wrist and hands relaxed. A relaxed wrist and hand will make your fingerpicking more efficient and faster. After positioning your hand, place your fingers on the strings. The top three strings, 4th (D), 5th (A), 6th (E), must only be plucked by the thumb, this will serve as your bass-like tone. The bottom three strings which produce the treble-like tones, 1st (E), 2nd (B), 3rd (G), will be plucked by your index, middle, and ring finger interchangeably. To practice, try to pluck the strings in sequence using your different fingers, the thumb for the top three, and the three fingers on the bottom three strings. When you master plucking the different strings in sequence using your finger, then try to device other patterns and try to be accurate and fast as possible. There are a lot of fingerpicking patterns, and if you are a beginner, it may be overwhelming for you to try them all. So I suggest on practicing one fingerpicking pattern on one chord, before trying combinations of it. So first we will practice a fingerpicking pattern that is called ‘Travis Picking’. It is one of the easiest fingerpicking patterns out there. Even though this is easy, this pattern is useful for establishing the rhythm and a good foundation for learning the overall style of fingerpicking. This pattern uses only two strings. So, to do this, hit a D chord with your left hand, and pluck the open D string with your thumb on the first beat and the G string with your index finger on the second beat. The third and fourth beat is the repetition of the first and second beat, but be mindful of playing this fingerpicking pattern. You must establish a steady and consistent rhythm on playing it. Now that we have learned a basic fingerpicking pattern using two strings, let’s try a pattern that involves the fingers. Now we will try a piece called “Inside-Out” that is based in 4/4 time. This is one of the easiest patterns, and it can suit any tempo. Let’s also try this pattern in the D chord. In this 4/4 time, all beats start with the thumb, and the off-beats are plucked by the fingers. So basically, what this means is that we begin by plucking the D string with our thumb and then plucking the B string with our Index finger with the off-beat, and then at pluck the B string and G string at the same time with our index and middle finger, and then off-beat again with E string, and then the open string D string with our thumb at the same time with the E string using the middle finger, then off-beat again with the B string, and then pluck the B string again using the index finger together with the E string, and then the last off-beat of E-string before going in on another round of 4/4. Now that you have learned two basic fingerpicking patterns, you probably now have a general idea of the flow or idea of the fingerpicking technique. There are still lots of fingerpicking patterns out there. For example, there is a variation of the “inside out”, which is the “outside in”. The variation makes you begin the 4/4 in from the E string coming inside to the higher B string. There are still lots of fingerpicking patterns out there on the internet. The point is that you should find the right pattern for your chosen song. Now that you’re done with the tutorial, you can try the following songs when you’re fingerpicking guitar. These are easy songs especially as a beginner. Fingerpicking may sound challenging and complicated, but it is quite easy once you try it with your hands and open your ears. The catch is that you have to allow your fingers to get accustomed to the tempo, so you’ve got to practice the patterns time and again. Slow down if you can’t quite make it at first, and then be faster once you mastered it. The pitfall and trap of playing fingerpicking patterns are that your fingers get accustomed to the pattern very much that it becomes rigid and you become uncreative. So you better slowly try other fingerpicking patterns out there on the internet and master them one by one. You can tell that you have mastered one fingerpicking pattern when you don’t have to think or you don’t have to look to your hands when playing. It is when you can produce the desired result without being strained at the least. It is also advisable that once you mastered a fingerpicking pattern, you must apply it and learn to play a song using it. Now that we have learned the overall picture and basics of fingerpicking, it is now time for you to pick your guitar and master it. Fingerpicking is an art of playing the guitar, you can only master it by practicing it in actuality. 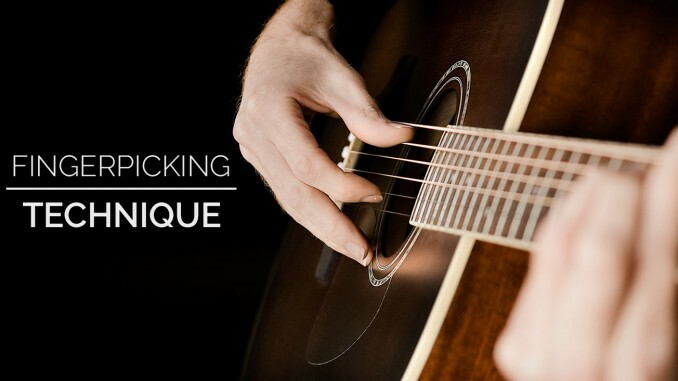 The goal of this article is to give you an overview and few basics to just help you start on your journey towards fingerpicking mastery. Just be patient and remember that great things take time.